The United States Food and Drug Administration (FDA) approved the drug flibanserin (sold under the brand name Addyi) for the treatment of women with hypo-active sexual desire disorder (HSDD) in August 2015. Hypo-active sexual desire disorder HSDD was listed in the DSM-4, the previous edition of the Diagnostic and Statistical Manual of Mental Disorders. The disorder relates to persistently deficient (or absent) sexual fantasies and desire for sexual activity, which causes marked distress and relationship problems. For a diagnosis, HSDD could not be due to the physiological effects of a substance or a general medical condition. Estimates of the prevalence of sexual desire problems vary widely depending on the criteria used – from 3% to 31% in one study. Others suggest up to 43% of women may experience low sexual desire. However, there is fierce debate about the definition of disorders of sexual desire, with HSDD described as a “highly controversial diagnostic construct”. The newer DSM-5, published in May 2013, combined features of HSDD and another condition known as female sexual arousal disorder, to form a new condition, female sexual interest/arousal disorder (FSIAD). This has stricter diagnostic criteria and as yet unknown prevalence. Flibanserin modulates neurotransmitters in the brain, increasing levels of dopamine and norepinephrine and decreasing serotonin. As dopamine and norepinephrine promote sexual arousal, and serotonin reduces sexual arousal, flibanserin may increase libido by improving the balance between these neurotransmitter systems. The committee members were concerned the drug had significant risks from side-effects, particularly if used off label or taken in combination with alcohol, and few benefits. The committee’s recommendation that the drug be approved therefore attracted widespread criticism that it allowed politics to trump clinical science. Sales flagged as insurers refused to cover the drug. With its stock value plummeting, Valeant reportedly dismissed the drug’s entire sales team and said it planned to reintroduce the drug at a later date. The company may be waiting until the 18-month restriction on direct-to-consumer marketing is over. A recent review of studies – including five published and three unpublished randomised clinical trials involving 5,914 women – concluded the overall quality of the evidence for both efficacy and safety outcomes was very low. The published studies reported more favourable outcomes than unpublished studies. The authors’ attempts to gain further information from study leaders and sponsors were not successful. Side-effects include dizziness (11.4% of users), drowsiness (11.2%), nausea (10.4%), fatigue (9.2%), insomnia (4.9%) and dry mouth (2.4%). The most serious problems – low blood pressure and a resulting loss of consciousness – are amplified by concurrent alcohol use. Other serious adverse events were uncommon but flibanserin can’t be viewed as safe without further studies including a broader range of diverse women. The FDA approved flibanserin on condition it carry a black-box warning not to drink alcohol while taking the medication. The manufacturer is also required to undertake three additional studies to examine the side-effects among women using alcohol with the drug. Strangely, the evidence about alcohol interactions with flibanserin presented to the FDA included data on 25 healthy volunteers, of whom only two were women. Side-effects are lessened if taken at night, but it has been reported about one out of every eight women will discontinue flibanserin because of adverse effects. A rigorous meta-analysis showed that, on average, flibanserin led to one-half an additional sexually satisfying event per month. This is a less optimistic finding than the (still underwhelming) one extra sexually satisfying event per month frequently quoted by reports. 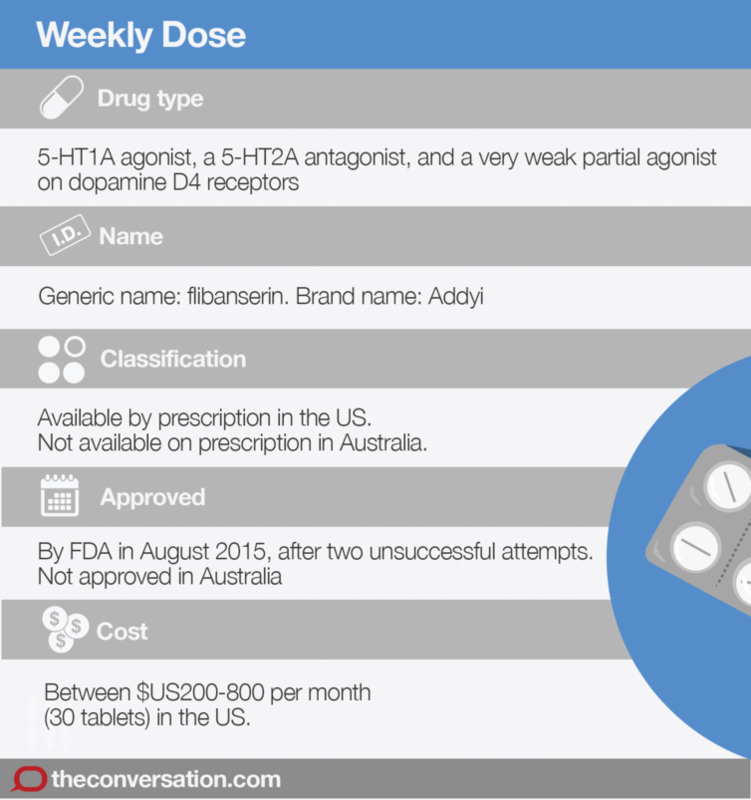 Flibanserin is approved for prescription only in the US; it is not available in Australia. US doctors must be certified before prescribing it, and dispensing pharmacists must also complete training. In the first month it was available, Addyi (the brand name of flibanserin) was prescribed just 227 times, compared with more than half a million for Viagra in its first month. Doctors had prescribed the drug fewer than 4,000 times as of February this year. In the US, a one-month supply of flibanserin (one 100mg tablet per day, taken at bed time) costs between $US200 to $US830, depending on insurance coverage and means of acquisition. That’s a lot of money for an extra sexually satisfying experience every two months.